Hi there! I know, I know, it's been FOREVER since i've posted. What can i say, life gets busy and while i do love this blog, there a too many other things that take precedence. Anyway, I am back on sharing ideas and some projects i've been doing. Today, I'm working on an Easter. Now, Easter has never been a super important holiday in my mind. I just never really understood the whole bunny and eggs thing. 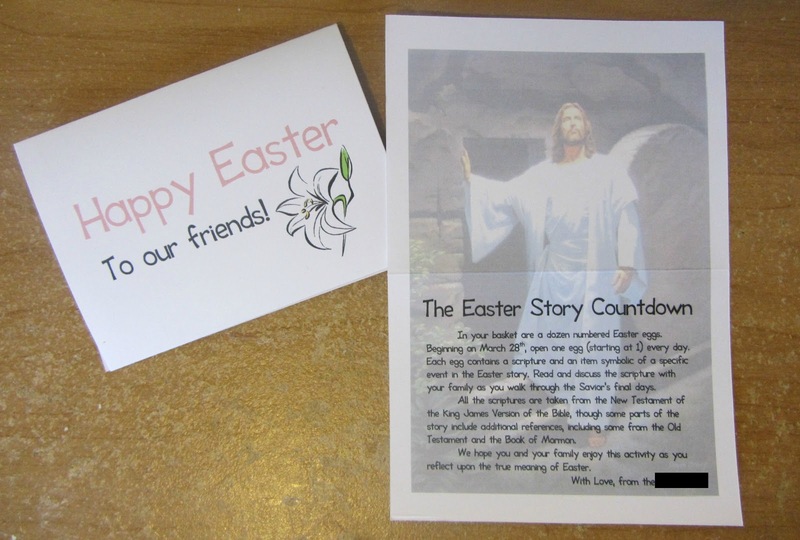 I mean, it's fun and all, but what does it really have to do with the Savior's death and resurrection (which to me is the real reason for the holiday). Christmas and Santa Claus at least makes a little sense to me - the symbolism of giving, of good will, of peace and love. A rabbit hiding eggs around your house? For some reason i just can't make a connection, no matter how much some try to force it. So I've been trying to think of ways for our family to focus on the true meaning of Easter a little more. Because really, when you think about it, the Savior's suffering, his death and especially his resurrection really deserve just as much occasion as his birth, don't you think? Anyway, I finally got around to putting together a countdown - something i've been meaning to do for the past three years: An Easter Story countdown. The first blog i came across, the one that inspired me, was We Talk of Christ. In my research today, I also found similar things HERE and HERE. I meshed all three together to make my own set of countdown eggs, using symbols and scriptures that mean the most to me. I made three sets, one for us and two to give away. I made gift cards for our friends explaining what to do. One of the friends that i'm giving a set to are religious, but not members of the LDS Church like we are. All of the scriptures are from the Bible anyway, but there are some "See Also" scriptures included from the Book of Mormon. Instead of making an entirely different set for them, I decided to gift that family a copy of the Book of Mormon along with their set of eggs so they can look up those extra scriptures if they are interested. But it'll be a great activity regardless of the basket. We'll get a nicer one for next year. I'm very excited to do this, and to have a daily opportunity to talk about the events of Jesus Christ's death and resurrection with our young children. It also takes us through little by little, detail by detail, allowing the children to focus on a little bit at a time and therefore (hopefully) remember it better. I'll be sharing the scriptures and symbols that i used in my own set as the countdown progresses, starting next wednesday. You can make your own set using the sites above, or you can join us here as we do ours. (April 8, 2012) Today is the last day of the countdown. We have been keeping our eggs on display throughout the countdown so our boys could see and remember. Here they are all lined up.